KIEV, Ukraine -- When his efforts as a leading youth activist helped bring about the pro-democracy Orange Revolution that swept Ukraine in 2004, Yevhen Zolotaryov thought the former Soviet republic had made a decisive move away from neighbouring Russia and towards closer engagement with the west. 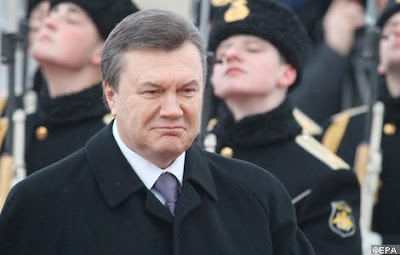 Taking charge: Viktor Yanukovich arrives for his February swearing-in. Economic reforms are on the agenda but many see a reversal of political progress. Today he sees much more work that lies ahead. “We could not have envisioned that such a big risk to democracy would emerge again,” Mr Zolotaryov says starkly. Eight months into the presidency of Viktor Yanukovich – whose original ambitions for the top job were derailed by the Orange Revolution – Mr Zolotaryov is one of many opposition politicians, journalists, democracy activists, business people and foreign officials who worry that political and media freedoms are being rolled back. Some suggest the new leadership is defaulting back to the heavy-handed system of the pre-Orange era in which big business, politics, pervasive corruption and remnants of Soviet rule are intertwined; others say it is trying to ape the “managed democracy” of Vladimir Putin, Russia’s prime minister. “It does look like Ukraine is moving backwards,” Steven Pifer, former US ambassador to Kiev, told a radio audience this month. Mr Yanukovich’s team say they are merely restoring stability after the bickering and chaos that followed the revolution – and with which many Ukrainians were fed up. That may be so. But the result has been a boosting of his powers relative to those of parliament and the judiciary, the arrest of opposition officials and a more active internal role for the security services. The opposition fears the administration will use its expanding influence to manipulate regional elections on October 31, further bolstering its hold on the country. The consequences reach well beyond Ukraine’s borders and its 46m citizens. As Europe’s largest country by area (excluding Russia’s European portion), its fifth most populous and home to some of the continent’s most crucial energy infrastructure, Ukraine’s choice of allegiance, and political system, has wide geopolitical significance. Kiev has therefore been wooed on one side by the European Union and the US – which hope it could become a beacon of democracy on post-Soviet turf – and on the other by Russia, which is seeking closer ties between the two Slav nations. Moscow’s ambitions are about more than a common history and Slavic roots. As Zbigniew Brzezinski, former US national security adviser, once famously quipped: without Ukraine, Russia stops being an empire with a foothold in Europe. Since Mr Yanukovich took office last February in the imposing presidential building up in the hills overlooking central Kiev, Russia has pushed even harder to pull Ukraine into an economic union of former Soviet republics. The arrival of a Moscow-friendly leader is also seen as a chance for Russia to gain control over Kiev’s strategic natural gas pipeline, which serves much of Europe. The west has been cautious. The EU is offering a free trade and association agreement, but it and the US have refrained from publicly criticising Mr Yanukovich, fearing that criticism could alienate him and push Kiev further towards Moscow. The opposition bemoans such hesitation. “Ukraine needs the international community’s attention today like never before,” says Yulia Tymoshenko, the former prime minister beaten to the presidency by Mr Yanukovich. She alleges that “political technologies” – or dirty tricks – now common in many former Soviet states are being used against the opposition. These range from legislative restrictions on who can take part and manipulating commissions that oversee elections, says Ms Tymoshenko, to creating “clone” parties with the same names as genuine ones in order to confuse voters. February’s narrow result was declared broadly fair by international observers. However, since then the new administration has taken swift and systematic steps to entrench the power of the president and his allies, according to its critics. Among the measures highlighted is the bending of constitutional rules to allow Mr Yanukovich to assemble a parliamentary majority. Parliament has since taken on a largely rubber-stamp role. A controversial agreement Mr Yanukovich negotiated in April, to secure reduced gas prices from Moscow in exchange for extending Russia’s lease on Ukraine’s port of Sevastopol, was ratified in 40 minutes. Then the government moved to overturn the post-2004 constitution, which had shifted powers from president to prime minister, arguing that its adoption was invalid. The claim was unanimously upheld by the constitutional court – but only after four of its 18 members resigned last month, some hinting they were under pressure, to be replaced by Yanukovich loyalists. Oleh Rybachuk, a former deputy prime minister, says the Yanukovich team has completed a “hostile take­over of power, whose purpose is as yet unclear”. Certainly, the opposition has come under pressure. Half a dozen of Ms Tymoshenko’s former senior officials have been arrested or are under investigation. The Yanukovich team says simply that these moves are part of an overdue crackdown on corruption. There are also concerns about the media. Ukrainians lament that news broadcasts are starting to resemble their Russian counterparts. Mr Yanukovich is portrayed in Putinesque fashion, ordering officials to sort out problems bequeathed by the previous government. The opposition, says Natalia Ligachova, head of Telekritika, a media monitoring group, now gets much less airtime. In its annual press freedom index released on Wednesday, the Paris-based Reporters Without Borders dropped Ukraine 42 places to 131st, alongside Iraq, Algeria and Cameroon. Two channels critical of the new government recently lost many of their frequencies following a legal case brought by a rival, Inter, that is ultimately owned by Valery Khorosh­kovsky, a business tycoon who in March was appointed head of the SBU security service. Mr Khoroshkovsky, who also sits on the judicial body responsible for appointing and firing judges, says his business interests are now being managed by his wife. Speaking to the Financial Times, he insists he did not abuse his political power and played no active role in challenging the frequencies of the other channels. Pressure is being exerted by the SBU on foreign non-governmental organisations, however . In June, Nico Lange, head of the Ukraine office of the Konrad Adenauer Foundation, a conservative German political foundation, who had published a critical report on recent developments, was detained for 10 hours on arrival at Kiev airport. He avoided being expelled on “national security” grounds only after telephone diplomacy involving the office of Angela Merkel, German chancellor. Last month, SBU officers visited projects supported in Ukraine by the pro-democracy network of George Soros, investigating whether the US billionaire’s organisation was funding political parties. Mr Khoroshkovsky says the checks on NGOs were the routine enforcement of a law prohibiting foreign funding of political parties. He dismisses allegations of democratic rollbacks as “made up”, saying these had “become a cult [for the opposition] that reached the level of absurdity”. The president himself vigorously denies any systematic assault on democratic freedoms. “Regarding any pressure, I would like to have evidence,” Mr Yanukovich told reporters this month. Serhiy Lyovochkin, the president’s chief of staff, says the opposition are making exaggerated claims in an attempt to discredit the administration. That said, international concerns about democracy in Kiev and its rapprochement with Moscow are growing. In an October 14 phone conversation Joseph Biden, US vice-president, told Mr Yanukovich of the importance of free and fair elections, and media freedom, as signs of Ukraine’s commitment to democracy and European integration. He added that process of constitutional reform should include checks and balances that served the interests of all Ukrainians. But some foreign investors and diplomats, as well as local businessmen and intellectuals, privately suggest that a period of firm rule, after the dysfunctional governance and public disillusionment that followed the Orange Revolution, might be no bad thing. The administration has drawn up an ambitious economic reform agenda aimed at improving Ukraine’s 142nd place (alongside Gambia, Honduras and Syria) out of 183 in the World Bank’s “ease of doing business” rankings, which measure factors such as regulation, property rights and commercial dispute resolution. One tycoon says an ideal scenario would be a strongman president who ruled for an extended single term, drove through economic reforms, then handed over to a democratic system. The danger is that – as Russia has shown – authoritarian rule is hardly a guarantee of reform. T he prospect of an improved economy might explain why Ukraine’s influential oligarch business elite have muzzled the media they control. More likely, say critics, is that business interests that supported Mr Yanukovich stand to gain; those out of favour keep their mouths shut. “Big business in Ukraine doesn’t really support European goals” of openness and transparency, says Mr Rybachuk. Whatever the real nature of Ukraine’s new regime, however, there are reasons to believe attempts to establish a Russian-style “managed” democracy may fail. It is not clear that Ukrainians will, like Russians, agree to trade political freedoms for higher living standards. The authorities may find it tough to deliver their side of such a bargain, without Russia’s energy wealth or the abundant credit and high steel prices that fuelled Ukraine’s growth before the global financial crisis. “The Russian vertical of power is supported by a powerful economic base, of oil and gas,” notes one analyst. Ukraine also faces a more fundamental contradiction. For now, the Yanukovich team insists it is committed to far deeper links with the EU than Russia is. Opinion polls show many Ukrainians favour moving towards Europe. But Stefan Füle, EU enlargement commissioner, says closer integration depends on continued progress on democratic values. The big question is whether Ukrainians are ready to defend their freedoms – if necessary on the streets, as in 2004. A recent poll by the International Foundation for Electoral Systems found a majority of Ukrainians either concerned or alarmed about reversals of rights. Other polls record a plunge in ratings for Mr Yanukovich – but also for the opposition, suggesting a more general disillusion.